A delegation of young farmers from all over the world gathered in Berlin to participate to the International Green Week 2017 from January 20 - 21, 2017. 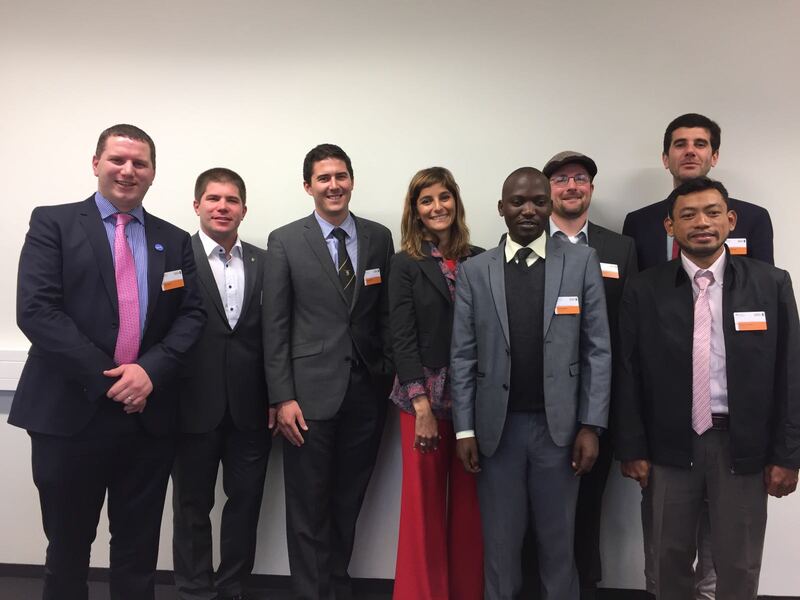 Synergizing diverse perspectives and visions on the future of the agricultural sector, 8 young farmers from Argentina, Cambodia, Germany, Ireland, Italy, New Zealand, Uganda and United States provided a dynamic and innovative view of the main challenges young farmers are currently facing. The 9th Global Forum for Food and Agriculture 2017 (GFFA), organized by the Federal Ministry for Food and Agriculture, under the theme ‘Agriculture and Water – the Key to Feeding the world’ gave the opportunity to discuss, reflect and adopt a common position. Water is essential for life. According to the last study conducted by UNESCO, the demand of water consumed will rise worldwide by a further 55 percent by 2050. Many are the reasons: a growing world population, economic development, growing demand of food, changes in lifestyles and consumption. Together with soil, water is the most important resource for agriculture. Approximately 70 percent of the freshwater used worldwide is used for irrigation. Today, on the occasion of the 9th Berlin Agriculture Ministers' Conference, a representative of young farmers, Daniele Perrone, Coldiretti Giovani Italia, member of the World Farmers' Organization (WFO) delivered a statement on behalf of all young farmers from all over the world focusing on the key role youth can play in addressing the challenge of feeding a growing world population while continuing to be stewardship of water. More than 70 Ministers of Agriculture, representatives of the agriculture and the food industry, international organizations, research, academia and civil society organization were convened at the German Ministry for Foreign Affairs ,to discuss some of the most pressing issues facing humankind. "The importance of what we produce, as farmers, is critical for food safety and security and a sustainable water management is key. Access to water is a social responsibility. It is not just a necessity, it is a human right", said Daniele Perrone during his statement. Ahead of the Ministerial Meeting, young farmers called on Ministers to involve young farmers more and more on political debates concerning the future of the agricultural sector. Access to water, technology, innovation and information, access to credit and investments, access to land, access to education were only few of the critical recommendations presented today. "As farmers we are the local resource for global policies to be implemented" said Perrone highlighting the potential of the generational renewal in agriculture. "The future of food security rely on young farmers" he added. Policy makers, farmers, private sector, academia and civil society must work together in a cross.sectorial and transboundary manner to maximize the productivity and sustainability of agriculture. Read the original story on the website of World Farmers' Organization, a Partner in GFAR. Download the Young Farmers' Statement at GFFA2017 here.